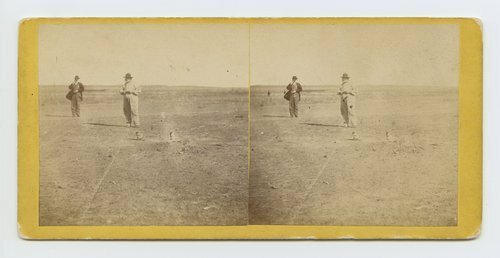 This is a stereograph showing two men observing prairie dogs and a prairie dog town, Abilene, Kansas. It is from Alexander Gardner's series, Across the Continent on the Union Pacific Railway, Eastern Division. The mayor of Prairie dog town, Abilene, Kansas. 447 miles west of St. Louis Mo.